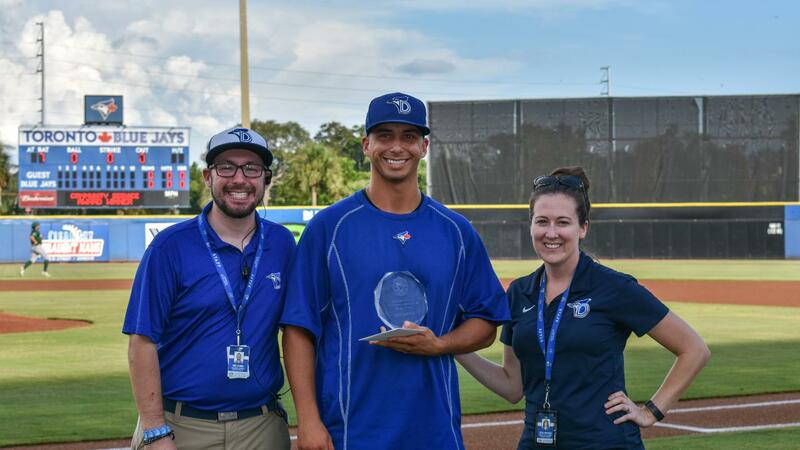 Right-handed pitcher Connor Eller has been selected as the 2018 Dunedin Blue Jays Community Service Award winner for his continued commitment to helping those in need in the Dunedin community and supporting Blue Jays community initiatives. The Blue Jays Community Service Award has been given annually since 2012 to the Blue Jays player who best exemplifies the team's commitment to enriching the Dunedin community through a variety of outreach programs that promote education, healthy lifestyles, and charity. Throughout the 2018 season, Eller represented the Blue Jays in the community through numerous appearances away from the ballpark as he worked to encourage local children and support local families. "Connor has been a leader in the clubhouse and the community for the past two seasons. He's exemplified everything this award stands for through his continued dedication to our community service projects," Blue Jays Manager of Community Relations Kathi Beckman said. "We couldn't be more proud to present him with the 2018 Community Service Award." Eller helped lead the 2018 Blue Jays Bookin' It To The Ballpark Reading Program, the largest community outreach program in the franchise's history, reaching fifteen-hundred elementary school students in 19 Pinellas County schools. He visited local elementary schools to support the program and promote literacy by reading to local students, answering their questions, and encouraging them in their studies. "My favorite event was definitely the reading visits," Eller said. "The kids get so excited when you walk in the door. Seeing their smiles when they come up and read with you is a joy." Eller was also active at the 2018 Blue Jays Bowling Tournament, an event that raised over $10,000 to benefit local families through Ronald McDonald House Charities of Tampa Bay. He also volunteered to help local families at the Dunedin Cares, Inc. Food Pantry, helping to fight hunger in the Dunedin Community. At their annual Hometown USA celebration, the Blue Jays collected 1,126 pounds of food for Dunedin Cares, Inc. as part of Minor League Baseball's annual BUSH's Beans Food Drive. Alongside teammate Riley Adams and mascot DJay, Eller helped sort and distribute the food the team had collected to local families. "It was really neat when Riley and I went to the Food Pantry. I think we gave back to the community in a different way. It was heartwarming to put yourself in other people's situation and be able to help them and show love to them." Eller joins a distinguished list of former Community Service Award winners that includes Danny Barnes, Matt Newman, Taylor Cole, L.B. Dantzler, Jorge Saez, Tim Mayza, and Josh DeGraaf.